The Noel Studio works in collaboration with the First Year Writing Program and Department of English to implement a Course-Embedded Consultants (formerly Writing Fellows) program designed to provide additional feedback and support for writers in ENG 095R and ENG 101R. 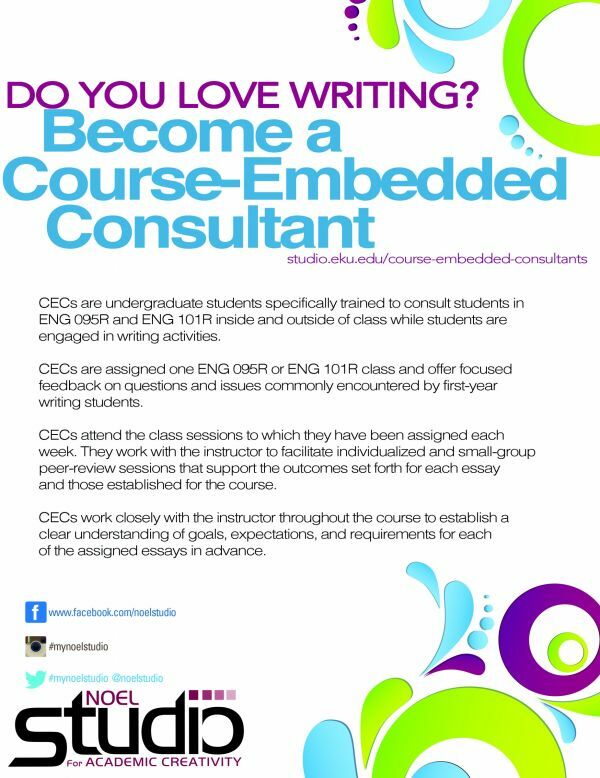 Course-Embedded Consultants or CECs are undergraduate students specifically trained to consult students in ENG 095R and ENG 101R inside and outside of class while students are engaged in writing activities. CECs are assigned one ENG 095R or ENG 101R class and offer focused feedback on questions and issues commonly encountered by first-year writing students. CECs attend the class sessions to which they are assigned each week. They work with the instructor to facilitate individualized and small-group peer-review sessions that support the outcomes set forth for each essay and those established for the course. CECs work closely with the instructor throughout the course to establish a clear understanding of goals, expectations, and requirements for each of the assigned essays in advance. · Meet once per week as a group and participate in training and professional development. · Attend the classes they are assigned and arrive early in preparation to support the instruction taking place in class that day. · Work side-by-side with instructors and complement classroom instruction and activities to support successful writing. · Work closely with the instructor to discuss due dates for drafts and final submission. Drafts will be due ten days (or about two weeks) before the final to ensure that CECs will have ample time to discuss writing with students. · Meet with students in class as determined in advance and outside of class in the Noel Studio or other public spaces on campus. · Meet with the instructor before each essay is assigned to discuss expectations and outcomes for each assigned paper in advance. · Meet with the instructor as necessary to discuss questions and comments about writer progress and feedback. · Submit weekly updates and reports. Schedules will be set in advance in collaboration with the CEC, faculty, and department. Please email Dr. Russell Carpenter, Executive Director of the Noel Studio, if you are interested in applying for CEC positions in the future.